With so many general purpose sets having already been produced, a more recent trend is to create sets that are focused on one activity, and many of these have come from the Strelets factory lately. Napoleonic era British infantry have been quite well represented in the past, but this set concentrates solely on men clearly not in battle nor on parade, but in fairly relaxed mood. The set title speaks of 'at ease', which is a part of the normal drill, but here it means men that are not performing any drill or manoeuvre. The main poses, which are provided with four copies of each, are of men resting their musket on the ground in various ways, and in one case apparently leaning on it, which is unlikely to please his superiors. All seem perfectly natural, and so as a result are valid poses. Some like the first and last man in our top row would not seem to be formed up as they are taking much space to their side, but since these could just as well be in camp or some other environment there is nothing much wrong with any of these figures. Although the box suggests no date for these men, the classic 'Belgic' shako immediately shows them to be for the Waterloo period, which is to say between the introduction of this shako in 1812 and its withdrawal from late 1815. A further dating clue is that all the men have a mess tin strapped to their pack, which first appeared in 1814, so these are for a very narrow, but popular, time period. All the other elements of the uniform look good for the period, including the short-tailed jacket, the campaign trousers and the short gaiters underneath. The kit too is correct, with the haversack and water bottle on the left hip, the cartridge pouch on the right, and a full pack with rolled blanket on the back. As well as the ordinary privates, the set includes a number of special figures, beginning with two pioneers. Each battalion had 10 such pioneers, who wore a similar uniform to the rest but of course carried the tools of their trade. These two both hold an axe, but again in a relaxed manner. This does beg the question of why do they have the axe out if they are not going to use it, which inevitably leads to the observation that neither man has a suitable case for the axe, so has little choice. 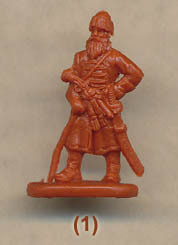 One man holds both musket and axe, so has no hands free to use either, which makes for a rather odd pose. Both men also have the trademark apron (a bit short in one case), and on their waist belt the bill hook in its sheath. Since both wear the standard knapsack there is no room for the axe or any other larger implement, which underlines why such men were actually given a different pack that did not rest in the middle of the back, thus allowing space for tools. The drummer in the set, again not 'in action' as such, has a good-sized drum in place ready to begin a beat, and holds the sticks with which to do it. He has chevrons or darts down both sleeves - a common decoration for drummers - and a straight sword on his left side. He has no cartridge pouch, so has shifted both water bottle and haversack to the right side. However while he has an apron on his left leg to protect it from the movement of the drum, this is much too small to fulfil that job adequately here. Next to the drummer is a bugler, with uniform and equipment much like that of the drummer, but with a very short sword at his side. Bugles were only used by light infantry companies, and this man has the correct wing epaulettes, like the drummer. Next we find the ensign holding a flag, unfurled but apparently not catching any wind. He is dressed as an officer, which is correct, and rests his charge on the ground. The staff is about 36mm in length, including the finial, which is a little shorter than it should be, and the flag too is somewhat smaller than it should be, although when limp like this it is hard to notice. Last of the figures are a sergeant and an officer. The sergeant is dressed like the men but has a spontoon rather than a musket, and has a sash around the waist. Such a spontoon was over three metres in length including the blade, but this one is much too short at about 2.5 metres long. The officer to his left is nicely done and has a curved sword, which is okay if he is for a light company, although officers generally pleased themselves in such matters anyway. So in general the uniform and kit is good, although the flag and spontoon are really too small. Also a problem is the pack on each man, which all have pockets on each side which simply did not exist in reality, yet Strelets seem happy to keep repeating this mistake which has occurred in some of their previous sets. The sculpting is pretty good for Strelets, which still lacks the kind of sharp fine detail we expect on the very best figures, but does not have the chunky feel of some earlier output. We struggled to make out the epaulettes, which seem to be a cross between the tufts of the centre companies and the wings of the grenadiers and lights, and the buttons on the officer’s jacket are much too close together. Muskets and some other slim items are not quite as slim as they should be, so these are good rather than great sculpts, but there is fairly little flash to be seen. These are basically decent sculpts with very few errors and some useful poses for a camp or other non-combat scene. It provides a decent number of relaxed infantry poses plus a good selection of 'command' figures that match the men well, so largely delivers what the title promises, and will surely find many uses for those with an interest in this period.